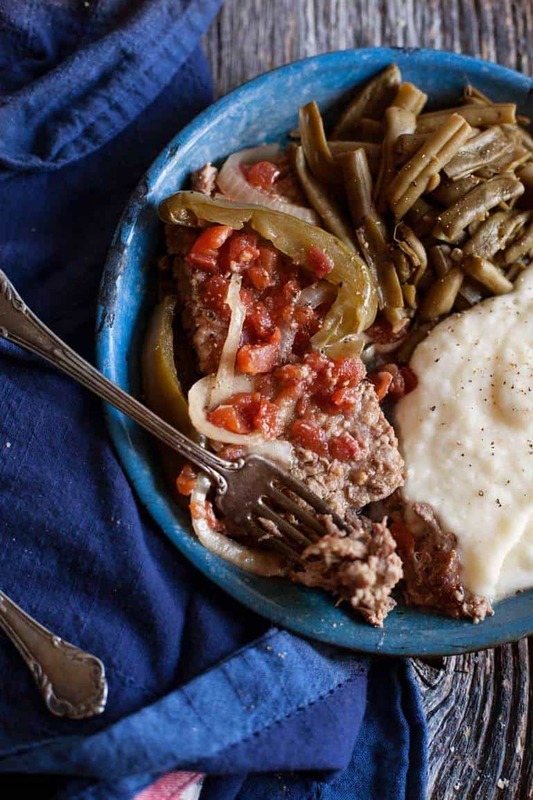 Swiss steak is true comfort food and this recipe doesn’t disappoint. Perfect for cooler weather, load peppers, onions, tomatoes and an affordable cut of beef into your slow cooker or bake it in the oven for a hearty meal. 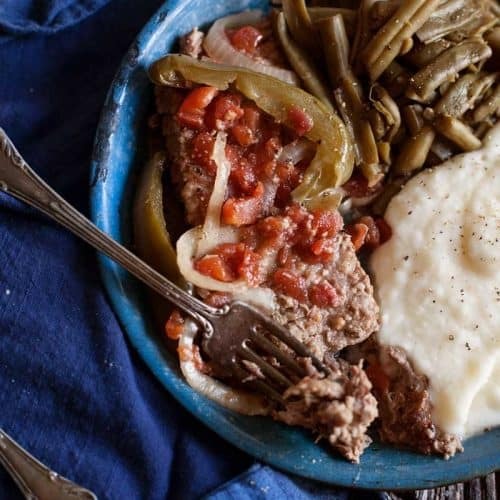 The truth is, there’s no way to make this swiss steak look pretty. It’s just not one of those dishes. I tried–well, I tried a little. But who cares? Once you slather enough mashed potatoes and some of the best doggone green beans on the plate, nobody really cares what it looks like. They’ll be too preoccupied using their fork to cut their ultra-tender swiss steak and telling you how amazing it is. I broke my no slow cooker rule here and dug mine out of the back of the pantry for this. Consider it a special occasion or proof I really am losing my mind. Either is fine. 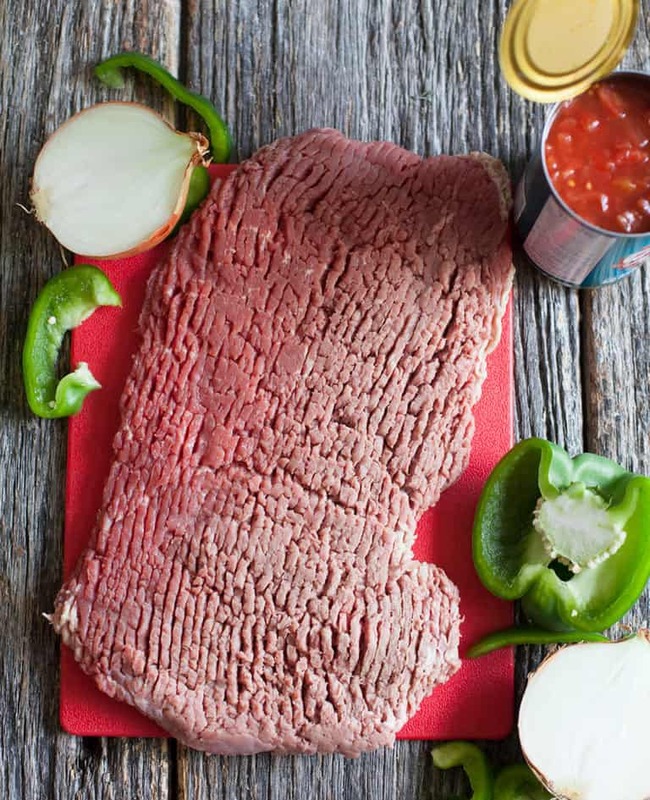 Use a round steak that you’ve had cubed. You can get a round steak fairly affordably. Then make eye contact with your guy behind the meat counter. Don’t let him run away. Then saunder up and ask him to run it through the cuber for you. He’ll do it. Basically the cuber just helps to tenderize the meat. When you’re ready to make your swiss steak, take a couple of minutes to sear your meat in a skillet to give it color and flavor. I cut mine into 4-inch thick pieces so it would fit in my slow cooker. Feel free to make your swiss steak in the oven. I prefer a cast iron dutch oven for this. It’s a no brainer for tender meats. If you don’t have one, just use a pan with a tight fitting lid and check your meat halfway through the cook time to make sure you don’t need to add more liquid. 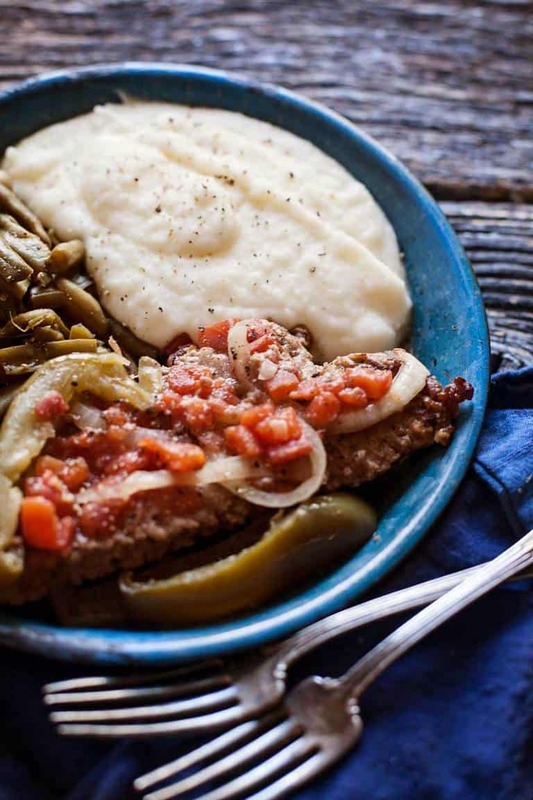 This homestyle swiss steak is tender and comforting straight from the slow cooker or oven. A family favorite! Cut your steak into 4-inch wide strips. Mix the garlic powder, salt and pepper together in a small bowl and sprinkle evenly over both sides of the meat. Dust the meat with the flour evenly over both sides. Shake off any excess and set the meat aside. Heat a skillet over medium-high and add the oil. Heat until just shimmering and add the meat in a single layer. It should sizzle immediately. Cook on one side until golden brown--about 4 minutes, then turn and cook 4 minutes or so on the other side. 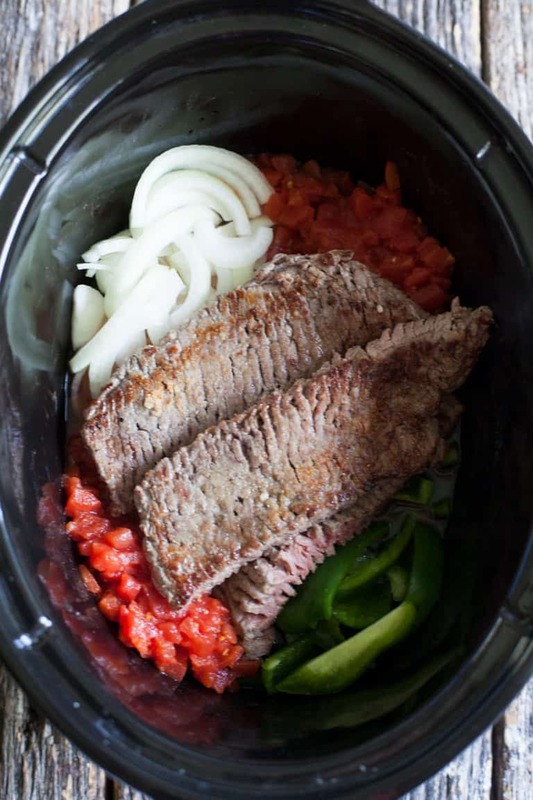 Turn off the skillet and transfer the meat to your slow cooker. If you used your dutch oven to sear the meat, just add the ingredients in with the meat. To the meat, add the crushed garlic, tomatoes, onions and peppers. Stir to combine, cover and cook on low 6 hours or until the meat is very tender and almost falling apart. If cooking in the oven, bake at 350 for about 2 hours (check it after one hour and add more tomato juice if it's cooking down too much) or cook until the meat is very tender. Serve warm with green beans and mashed potatoes. Thank you for your recipe. No offense and God Bless as I love all people..
Maybe I did something wrong, I don’t know. My steaks were dry and tge sauce was very bland and watery. My mother used to make Swiss Steak, sadly she has past on… I can still taste hers – it was that good. Please have a great year later.